Those Safai Karmi who was already enrolled in safai work on contract basis they will get preference in the upcoming recruitment. Notification will be published by Nagar Ayukt of concerned Nagar Nigam. 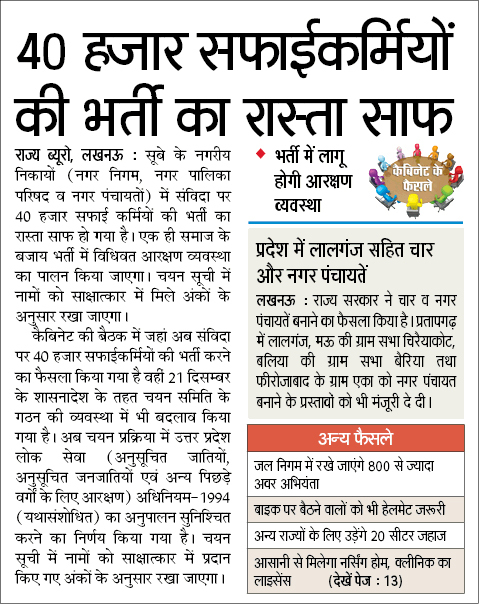 all recruitment process will be completed by Adhinasth adhikari of Nagar Nigam . This announcement was done by Chief Minister of Up in a rally. Currently government not appointing Samvida Safai Karmi in government department, nagr Nigam , autonomous institutions . etc . That’s why government decides to recruit Safai Karmachari through working authorities of cleanness works. Nagr vikas vibhag (Nagr Nigam development administration) has prepared a proposal regarding this recruitment. After approval of this proposal nagar vikas vibhag will publish the official GO / Shasanadesh regarding this recruitment . Before starting the recruitment process, government will publish advertisement and notification in local news paper. Selection of the eligible candidates will be based on through the merit basis. Selected candidates will be appointed in the pay scale 5200-20200 and grade pay of rs 1800.
so be alert with vacancy . Upjob.in will never provide you fake vacancy notification . so subscribed your emails for more news updated. 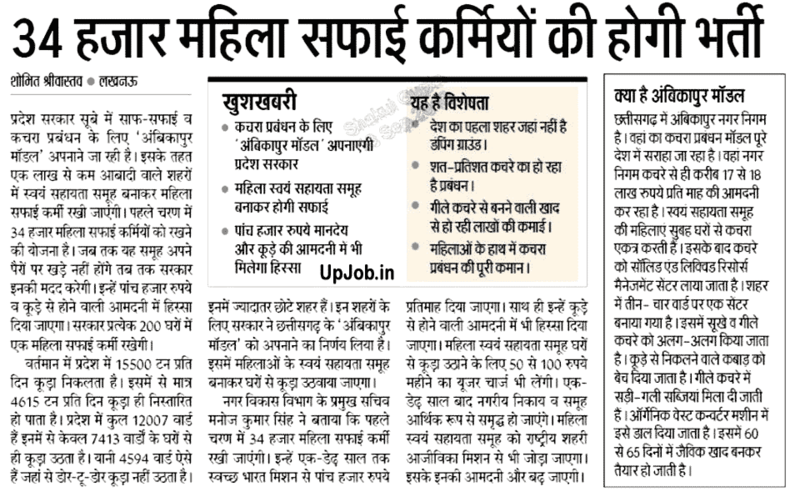 When official news , notification of Up Safai Karmi bharti will be published , Upjob.in will inform you here.